Killer Characters: Summertime... and the livin' is uneasy. Summertime... and the livin' is uneasy. Heartbreak Island... sometimes when I walk Hoppy from our home in Queensville down along the St. Clair River, the island is barely visible through the mist. Then the fog will clear, and I'll begin to see bits and pieces... the dock, the beach, the Ice House Restaurant. The island has always been my little haven. Though we rent out our Rose Tree Cottage most of the summer, before tourist season Hoppy and I will go over for a couple of days just to clean the place and open it for our first guests of the year. 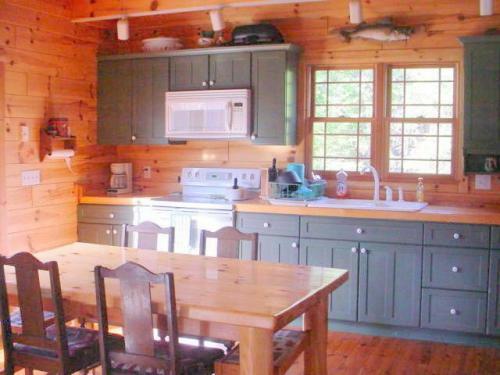 I can sit on the porch of the blue painted clapboard cottage and barely see the river slip by through the pine trees that line the opposite side of the road. There are a few other cottages, but I can still see the sparkle of the St. Clair in the sun. And then in autumn, when all the tourists have fled for warmer climes, Hoppy and I will go out again for a few days just as the first chill is biting the air, and the trees have shed most of their leaves, before the cold really takes over and makes it a chilly ferry ride. It's a peaceful place of joy and relaxation. I never, ever thought murder would intrude on my idyllic little piece of heaven. It started this way... the cottages on the island use a system of leaching beds and septic tanks to dispose of waste. That is the prosaic, dull and stinky side of island life. If the leaching bed isn't working properly, it floods, and ours wasn't working well and hadn't been for some time. Hoppy and I went over to stay at the cottage to oversee the work, and... well, to avoid living in the house with my mother, while she and my dad are visiting. But as seems to be happening lately, murder will intrude. You'll hear the whole story in Freezer I'll Shoot. Victoria claims that people have really enjoyed reading about my woes in Queensville. Sure glad someone's enjoying my troubles, because I could do without them! Don't get me wrong, my life is wonderful; I have everything anyone could want. Except these darned murders keep cropping up. Well, there are always cookbooks and romances to read, my vintage kitchen goodies to have fun with, vintage recipes to write about, as well as Daniel to date and Detective Zack to ponder. How do you make your way through difficult situations? What gets you through, when times are tough and the livin' is uneasy? 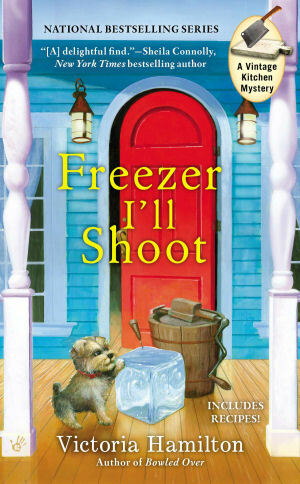 Freezer I'll Shoot will be available November 5th of this year, and I can't wait! If you want to be sure not to miss it, it is available for preorder right now at Amazon and Barnes and Noble, etc.! 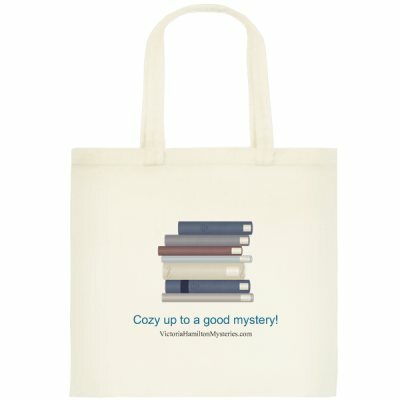 tote and pen for your summertime reading fun!! Edited to add: This contest is open until Midnight, Sunday June 23rd... good luck, folks!! BTW... the tote is so cute! Perfect for carrying books to the beach or anywhere you happen to be going this summer... even work! LOL! The tough times? Its a matter of taking it one step at a time. You do what you have to do. Reading a mystery often takes my mind off the problems as do walks in the park. One day at a time is the only way you can go - and looking back to see that you can and have survived the hard times. Thanks for the giveaway opportunity - great series. Working with my hands (something crafty), reading and PRAYER...knowing that things will turn out as they are supposed to. Looking forward to reading this series! I've read Deadly Grind but haven't gotten to Bowled Over yet. 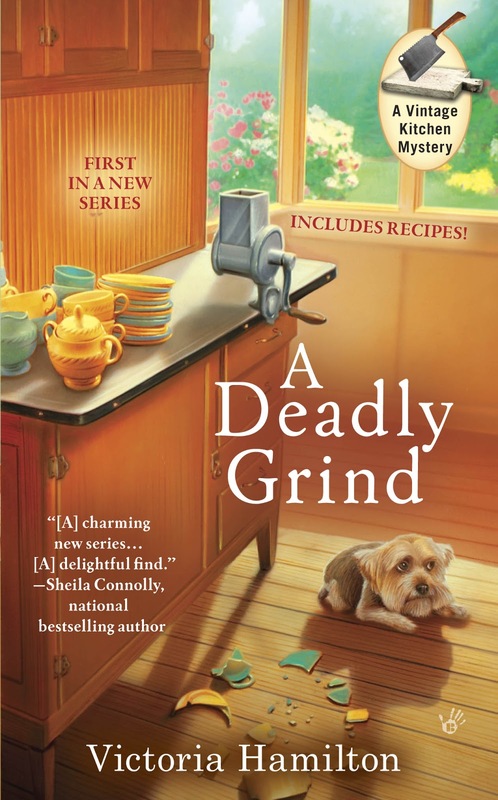 I loved Deadly Grind... can't wait to get my hands on these two. Thank you! Prayer and reading are good, but doing something for others helps to take my mind off of my own troubles. Sending a card. Making something for someone, such as card or jewelry. A telephone call...text...email...note...letter. I love all these suggestions... keep 'em coming!! Reading is a good way to escape for a little while. I also like to walk my dogs down to the water. My smaller dog (pictured) is determined to one day catch the waves as they roll in. As the water rolls up on shore he runs at it, mouth open, ready to catch it. The look on his face when the water rolls back is the funniest thing. A perfect cure for whatever is causing a bad day. I love A Deadly Grind. Hoppy sounds adorable. Looking forward to Bowled Over and Freezer I'll Shoot. I have Deadly Grind and Bowled Over in my ever increasing to be read pile for this summer. Glad to hear there is a new book to add to my list. Nothing better than a stack of books to keep me occupied between games watching my daughter and her friends play softball in the summer. Turn my attention to helping others with bigger problems. Reading always helps put life in perspective. Reading gets me through tough times. It is my escape. During the tough times, I except the shared strength of my sisters and my friends. And prayer, always prayer. Enjoyed A DEADLY GRIND. I have BOWLED OVER in my TBR stack and look forward to FREEZER I'LL SHOOT! Love the description of her island hide-a-way. I'd love to visit. Loved A Deadly Grind. 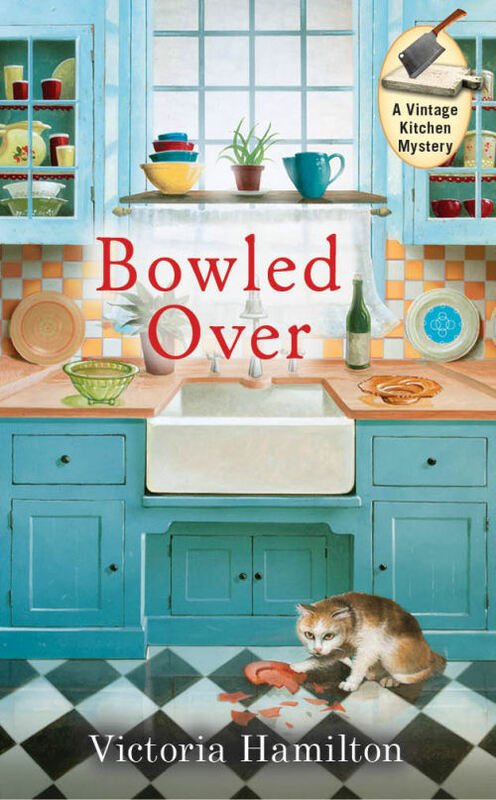 Would love to read Bowled Over. Great covers...also love the title of the third book. I have found that when times get tough prayer is the answer. Reading, Knitting, clearing the calendar of everything unnecessary, comtemplation, talking to my birds. All those help. I agree with so many of the others - prayer and perspective. Like you said, life is wonderful. Right when we are feeling like our life isn't easy is the perfect time to reach out to help someone else. Freezer I'll Shot is a GREAT title by the way! Thanks for the chance to win! After I was diagnosed with m/s I decided that nothing is ever as bad as it seems. Through faith, family and the unconditional love of my service dog/partner in adventure, I can get through anything. And with a few kisses of my boy Rufus(he is a yorkie and yes he is my service dog), I can actually smile through it all. Reading and embroidery are my calming activities. I enjoyed the Grind, now will have to get to Bowled! No vacation for us until sometime in August.. so I'm thinking either Cape Cod or Newport RI. I have Deadly Grind and enjoyed it immensely. I'd love to be able to add Bowled Over to my collection.. I've added the new title to my advance title release list so I don't forget it. I have yet to read either of these books so would welcome the chance to do so. I relax by reading. What a fun looking series. Thank you for the chance to win. Reading is also a great way to escape! Believe it or not, when times are tough I find focusing on others helps me to move forward myself. For one thing, it take me out of my own problems and that "poor me" attitude that can develop, for another it helps to realize that everyone is going through something and to make a difference in another's life. Of course, prayer is always the best! I would probably turn to comfort food or chocolate to make it through tough times. If I'm anxious or worried, I tend to not watch TV - I just "zombie out" & accomplish nothing. So I will read to keep my mind focused. I tend to cover the daily got to get it done stuff as I read through the mystery. I would love the chance to win both of the books in the series! I love a good murder or two. I like to face things and take them head on. Deal with issues and then move on. When times get tough I hunker down with my dogs and avoid the rest of the world. Living on the island sure sounds heavenly, and I do hope you get your septic troubles handled soon and without too much stink. I guess murder and other crimes are everywhere, even in a small community. But i have every faith in you that you can figure things out. While you are away with Hoppy, who is taking care of Denver? I'm having a tough time right now. I'm dealing with an injury which may or may not be work related and dealing with different insurance companies, but that's not the worse bit. My eldest cat crossed the Rainbow Bridge this morning. What can help-nothing but time. I'm drinking a pop and cuddling the other kids and trying keep busy with other thoughts. Aurian... my mother is looking after Denver! (eye rolling) They don't get along, but at least she makes sure he's fed and has water! Have not read either these yet, but have them on my wish list. Good luck to all. I can't wait for Freezer I'll Shoot. What a great title!! I pray a lot. retreat to solitude, and think. Reminds me a little of my own life. Septic backup is NO FUN! 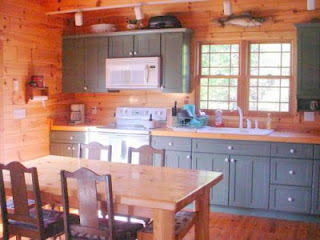 And my kitchen is definitely a vintage model. Anyway, don't forget the RidEx! Wise move, Jaymie my dear, to get away from Mom for a few days. Too bad you have to deal with a murder while you're escaping; almost makes me feel guilty for enjoying your misadventures so much. Almost. Just as I'm looking about for new summer cozies, I discover "Killer Characters". Halleluliah! Knitting. It can get you through just about anything. I was going to be funny and say Xanax...but definitely the thought of a good book and a hot bath has gotten me through a lot of tough days. Prayer and good friends get me through troubled times. This is a great series. I love the titles. My Faith, my family, and my friends help me...along with cuddles from Libby the cat and Sir Charles the dog. Katreader-Sorry about your loss. I spent 8 years fighting insurance companies and also lost my beloved kitty at the most critical time. I hope your other kitties with comfort you at this time. I have had an unusual amount of tough times in my life and it continues on a regular basis. I get through them by facing them head on and being pro active. After they stress is over or at least backing off for a few days, I curl up with my cat and read, read, read!